Of course, if you really want to create a healthy nation, you have to be prepared to see widespread job losses across the industries that currently profit from sickness and disease. Those industries include the pharmaceutical industry, agriculture giants, junk food retailers and even the mainstream media. If America gets healthy with good nutrition, each of these industries would suffer considerable losses in jobs and revenues. They depend on disease for their very existence, of course, so eliminating (or greatly reducing) disease will have a devastating impact on them. But that's a good thing for America. Every job that treats disease is a job wasted from a big picture civilization point of view. Without disease, that worker could be doing something far more productive such as contributing to a brighter future as an educator, artist, engineer, writer or some other noble profession. It's not that being a doctor or nurse isn't noble (nursing, in particular, is quite a noble calling), but wouldn't it be better for the economy as a whole if all the jobs focused on disease could be rendered obsolete by healthy people who don't need such services? Under such a scenario, all the "disease jobs" could be shifted to something else (like researching renewable energy technologies, for example). The Pharmaceutical Industry - Big Pharma would lose a fortune if the population got healthy with nutrition. It sells billions of dollars worth of drugs every year and depends on disease to sell them. All the pharmacies that retail those drugs would also go out of business: CVS, Walgreen, Wal-Mart, Safeway, etc. The Medical Industry - All those hospitals, doctors' offices and emergency rooms also depend on a steady stream of diseased, malnourished Americans to guarantee their job security and incomes. A drop in disease would mean the rapid downsizing of hospitals and clinics. The Food & Agriculture Giants - The Big Food and Big Ag companies bet their profits on the continued purchasing of processed, nutritionally-depleted food and beverage products that directly contribute to degenerative disease. High-Fructose Corn Syrup, for example, is a very profitable ingredient to use in processed foods. Never mind the fact that it promotes diabetes and obesity... it's cheaper than sugar! The Mainstream Media - The MSM, meanwhile, depends on the advertising dollars of drug companies, soda companies and junk food companies to keep its own financial lifeline intact. If junk food and pharmaceutical advertising were both banned, the media would suffer enormous losses in ad revenues. It's all those nutritionally worthless, disease-promoting products that keep the MSM in business! Remember, the MSM is in the business of "junk food news," meaning they produce a "diet" of junk news for human consumption (http://rense.com/general88/paid.htm). The Health Insurance Industry - This industry realizes huge financial gains from sickness and disease. The more people are sick, the higher the insurance premiums (and the more profit is mathematically built in). Furthermore, the more people get sick, the more they feel they need to buy insurance, so more disease inevitably leads to higher revenues across the health insurance industry. Junk Food Retailers - This includes your local grocery store, by the way, which is stacked to the hilt with processed, disease-causing junk foods. It's the same story with Costco or Sam's Clubs. Wal-Mart and even local pharmacies are also chock full of disease-promoting junk foods that nutritionists know are linked to cancer, heart disease, diabetes, obesity, kidney stones, depression and many other problems. But selling junk food is big business and grocery stores aren't about to restrict the products they sell just because they happen to promote disease. Pharmacies still sell cigarettes! Disease Non-Profits - Never forget how much money is collected by the disease non-profit groups like the American Cancer Society. These "rich" non-profits depend entirely on the continuation of their sponsored disease in order to stay in power. In a world without cancer (to reference G. Edward Griffin's book title), there's no need for the ACS. Nor for the Susan Komen cancer group with all its ridiculous pink ribbons that pretend we can all cure cancer by going shopping. For every significant disease affecting the western world today, there's an associated disease group depending on that disease for its own survival. In all, these industries represent anywhere from one-quarter to one-half of the entire U.S. economy. 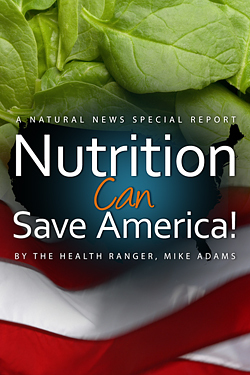 Unleashing a wave of nutrition and health in America would therefore destroy a significant portion of the U.S. economy as currently configured. It would put rich, powerful corporations out of business and send hundreds of thousands of works out onto the streets to look for new jobs. And yet, it's still a good thing for America, because all that economic activity (focused on disease) is really a net LOSS to America, not a net gain. Economists don't differentiate good from bad when it comes to GDP, but the truth is that every dollar spent treating someone's disease is actually a dollar wasted on something that could have been prevented for a nickel's worth of nutrition. Nutrition is a good investment in America. Why spend dollars treating disease when you can spend nickels keeping people healthy? Putting the disease industry out of business is a good thing, because if sick-care isn't getting much business, that means the People are getting healthier, happier and more productive. And that's what keeps a nation strong and successful in the long run.